Hi Loves! How is everyone? I hope you are all ready for Christmas. I am ALMOST THERE. Ugh so much wrapping to still get done. I am hoping to get everything complete here in the next couple days so that I can enjoy Christmas and not be stressed at the last minute. Do you need a last minute gift idea that you can do yourself? 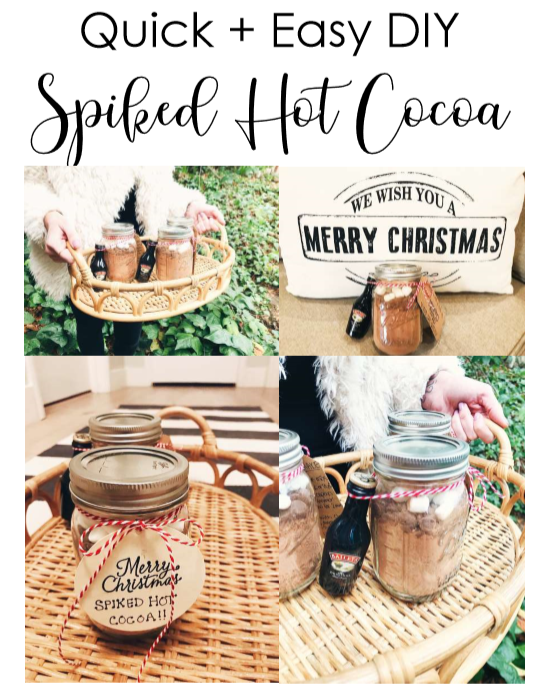 I wanted to share with you guys today a Quick and Easy DIY Spiked Hot Cocoa Recipe. Every year my husband and I choose a DIY gift to make for our friends and family. This year we chose Spiked Hot Cocoa and Homemade Salsa. We got these done so quickly and it is the perfect thing to do as a last minute little gift. 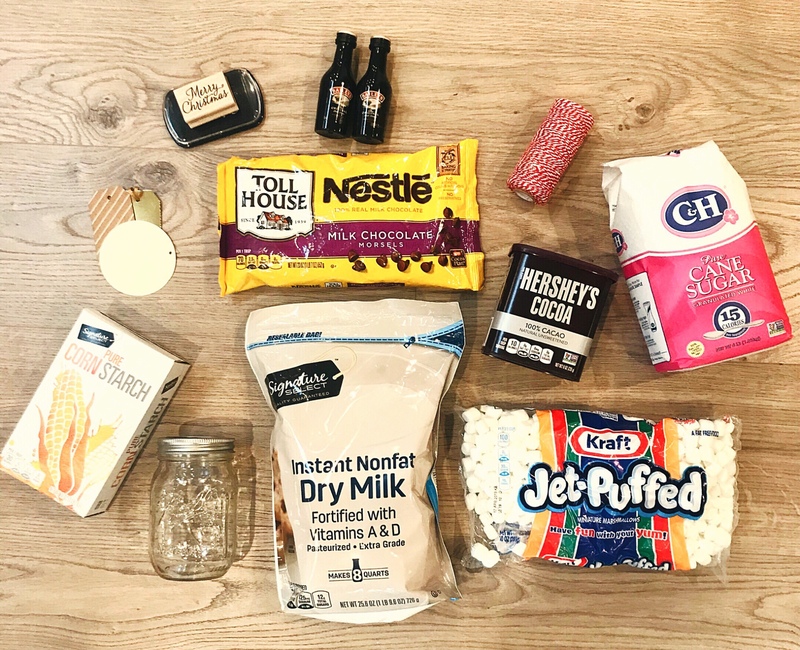 You probably have most of the ingredients at home already and you may even have some mason jars you can use laying around. Combined the Corn Starch, Dry Milk, Sugar, and Cocoa Powder in a big bowl. Mix until thoroughly combined. Add your dry ingredients into your mason jar. I would fill it a little more than half way so that you have room for the chocolate chips and the marshmallows at the top. Next top the jar off with your chocolate chips and marshmallows. I then tied the mini Baileys to the jar with some twine and added a tag that had the instructions on how to make it on it. To Make Tag to Read: Add 3 tablespoons of mix to 8oz milk or water into a saucepan and stir. Simmer on med/low for 2 minutes. Serve with chocolate chips, marshmallows, and Irish cream. ENJOY! Aren’t these just the cutest. 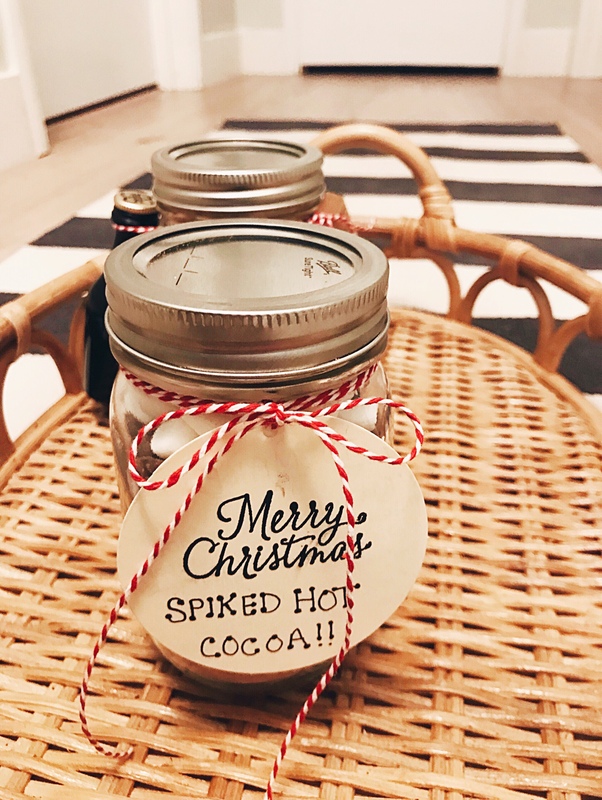 Everyone is going to need a good spiked hot cocoa on Christmas so I thought this was the perfect little gift for my friends and family. I love how simple and easy these are. I hope that you will give these a try. You can get creative with the twine and tags. You can stamp them or draw something festive on them. I hope you all have an amazing week. I hope you all slow down a little and take in all the great things around you. I always get so bogged down by the Christmas madness and I don’t take enough time sit back and enjoy all the simple things. Take time to appreciate peoples expressions, the smells in the air, the cold or warmth that surrounds you. Most of all just be present. Put your phones down and engage with people! Thank you so much for stopping by today and I hope you are enjoying this holiday season as much as I am. These are SO cute. 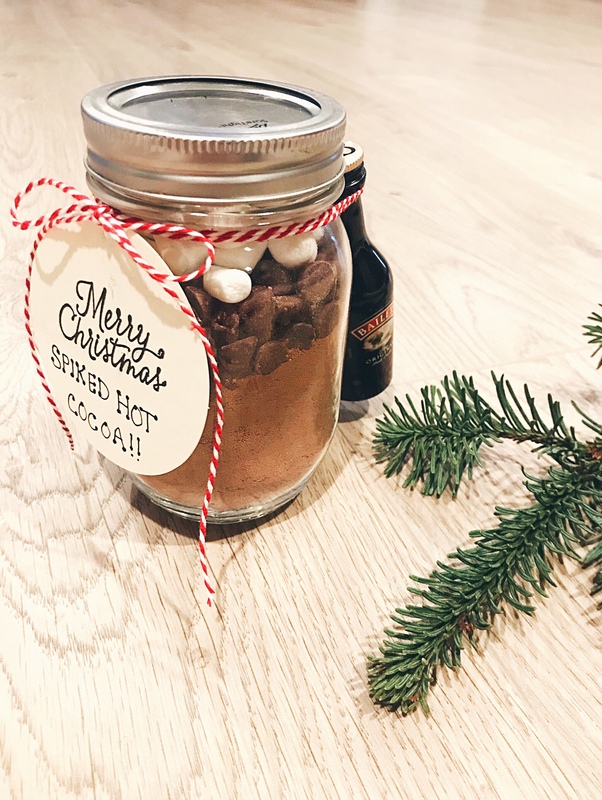 Thanks for the recipe & simple gift idea! I love this gift idea! 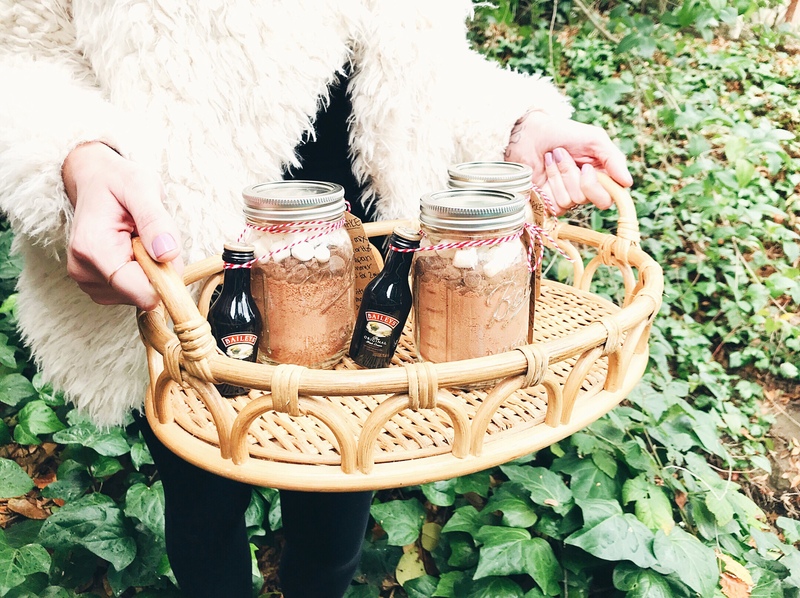 Baileys in hot chocolate sounds delicious. I love Baileys Hot Cocoa! I started making this on Thanksgiving with the Salted Caramel Flavor. I want to try the dairy free though. Great recipe. You speak my love language! Baileys and hot chocolate? I would love to be your friend, if it means receiving these. In the meantime, I will settle on making these for my friends. 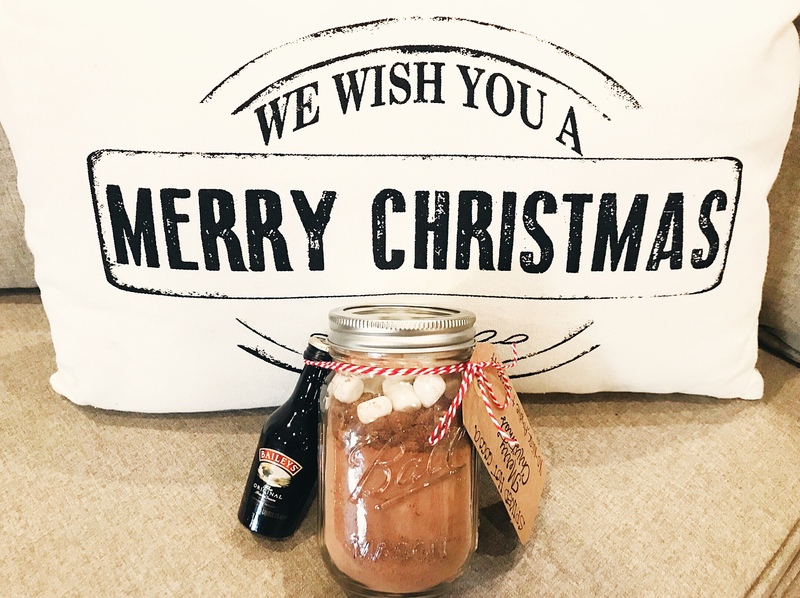 Such a cute gift idea! I’ll have to save this for my co-workers next year.